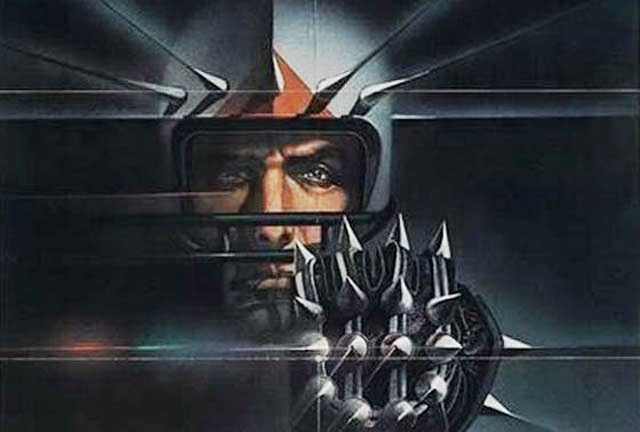 1975 - Looking Back At ROLLERBALL | Warped Factor - Words in the Key of Geek. 40 Years since its original cinematic release, Martin Rayburn examines if Rollerball still packs a punch. I'm not entirely sure how old I was when I first saw Rollerball but I was certainly many years younger than the movie's certificate seemingly allowed, a plus of the early VHS rental boom with store owners seeing those classifications as more of a suggestion than rule. Whatever age I was it was a movie that instantly became a firm favourite with young me, and one that I've always added to my collection in every new format that it has been released on. 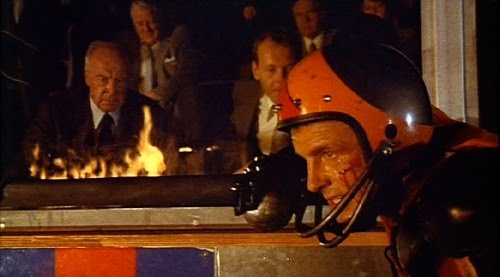 Set in "the not too distant future" at a time when the world is run by corporations, Rollerball tells the story of Jonathan E (James Caan), a sporting hero whose growing popularity is in danger of running contrary to society's enforced rules. After he refuses to resign (for reasons never properly explored) the rules of the game are changed to make it so dangerous that he will surely be killed, thus quashing any idolisation the public may have for one man. As a youngster I would often fast forward the tape to watch all the arena scenes. Inviting friends round to show them off because they featured the most spectacular sport you could begin to imagine. Rollerskates, motorbikes, studs, explosions, a hefty metal ball and a banked circular arena combine to offer excitement, injury and death. Even today those arena scenes are still just as impactful, brutal and disturbing as they were 40 years ago. They have an energy which is sorely lacking from the non-arena segments of the movie, it's really like chalk and cheese. 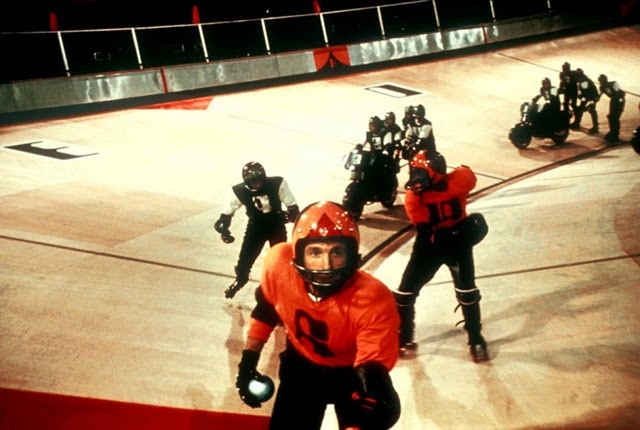 In many ways Rollerball has a lot in common with the current darling of dystopian sci-fi, The Hunger Games. Both feature a sport created for entertainment by an antagonist who wants to remind the people of the futility of individual effort. When the hero decides to stick one finger up at the establishment and captures the imagination of the people, the rules of the game are changed to make it (seemingly) impossible for our protagonist to win. However, this is where the similarities end, as Jonathan E is no Katniss Everdeen. Regardless of age I've found myself drawn into Everdeen's plight, and the scenes away from the Hunger Games them-self are just as important to the story as the main event. In short, Katniss is far easier to connect to, her plight is one which you easily feel invested in, this is never apparent in Rollerball. This is likely more to do with evolving production techniques in movie making and storytelling, but it is something that really dates the film. Out of the arena James Caan is a listless Johnathan E, at no time do you connect to his story and growth (what little there is), and with all the loose meandering around it's a case of clock watching until that next arena segment. Maybe young me had the right idea? But if truth be told we come to Rollerball for the game and not for the story. What is lacks in scope and monumental depth of its compatriot, it more than makes up for with its thrilling dystopian sport. The final arena scene alone is worth the price of purchase. A moment of classic sci-fi, even if that moment feels very routed in the 1970s. Rollerball is now available on Blu-ray. By day, an ordinary bloke in a dull 9 to 5. By night, a tired ordinary bloke. Martin still hasn't worked out what he wants to do when he grows up. He is currently 46.